You want to create an SSIS Package that will read the folder Path, File Type, Filename like and Retention Period from a Table and then loop through each Folder path and delete required files those retention period is more than defined. We will be using Script Task to delete the files from different folders depending upon the retention period which we will define in our table. Create create the PurgeInformation table so we can insert different entries for folder from which we would like to delete the files. Create an SSIS Package by using BIDS or SSDT and Create a variable VarObject of type object. Use Execute SQL Task to read the values from dbo.PurgeInformation table and load into VarObject variable as shown below. 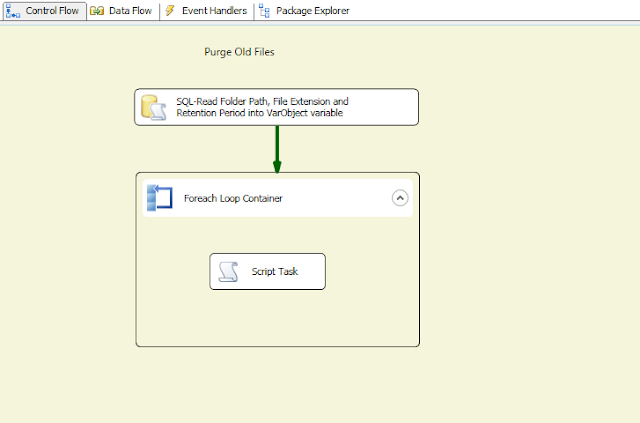 Bring For-each loop container on Control Flow Pane. We need to use Object type variable in For-each Loop so can read one record on each iteration. After configuring For-each Loop, Drag Script task inside For-each Loop Container and add all user variables we have created above. Your SSIS Package is ready, You can schedule your package by SQL Server Agent nightly or can run on demand to delete files from different folder with different retention period. You can add new folder path in table to delete required files. It looks like the rest of your C# code got chopped off. Any chance you can re-post?